World Rugby must take more control over global tournaments or risk damaging the sport's integrity, the umbrella organisation that represents national player associations has warned. International Rugby Players' call for greater oversight by the sport's governing body has come after the controversial finale to the European 2019 Rugby World Cup qualification tournament. World Rugby has already announced that it has set up an independent disputes committee to review the circumstances surrounding Belgium's 18-10 win over Spain in Brussels on March 18, which was officiated by a Romanian referee and touch judges. Spain's defeat meant that Romania qualified for next year's tournament in Japan and the visitors were infuriated by referee Vlad Iordachescu's decision-making, prompting ugly scenes after the game. 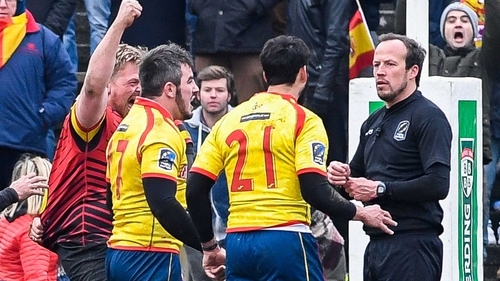 It has since emerged that the Spanish Rugby Federation had asked Rugby Europe, the qualifying competition's organisers, to appoint different officials but were turned down. And the picture has grown even murkier with allegations that unspecified teams used ineligible players during the qualifying tournament. For its part, Rugby Europe has convened an independent judicial panel into player conduct after the match in Brussels. In a statement, the chief executive of the IRP, Omar Hassanein, said: "We support World Rugby's efforts to eradicate any perceived manipulation of fair play. "But this investigation highlights the need to closely monitor the activity of regional associations, particularly around Rugby World Cup qualification matches. "Players, especially at tier-two level, sacrifice a lot to follow their Rugby World Cup dream and, if integrity is undermined, it will erode the trust which exists between players, administrators and fans of our sport. "The players in this situation deserve better than this. Competitions at all levels of the professional game need to be administered with the same high standards to preserve the integrity and values of our sport."